A new advertisement running in Japanese Video Game retail stores has a surprising twist. Frieza, the main antagonist of the second Saga in Dragon Ball Z, is used to gauge the power of the new Console. 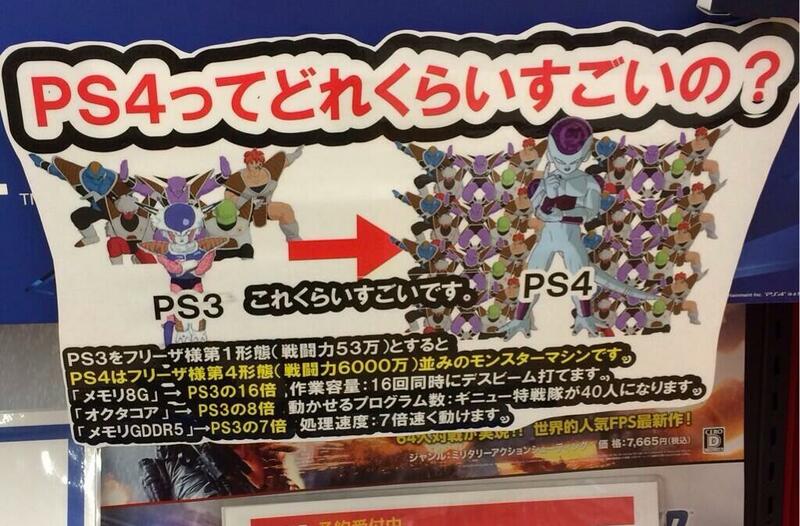 PS4 is a monster machine like the fourth form of Freeza (battle power 60 million). [8GB Memory] -> 16 times the PS3. Power: Can use the Death Beam 16 times at the same time. [8 Cores] -> 8 Times the PS3. Number of programs that can be executed: The Ginyu Force is now 40 people. [Memory GDDR5] -> 7 Times the PS3. Processing Speed: Will move seven time quicker. As hilarious as this ad is, it does showcase the interest in the Sony PS4 in Japan. The console recently hit a 5.3 Million Sales number, and it hasn’t even launched in its home country. What do you think of this? Do you think the success of the PS4 will push Devs to make more anime related games for it? Or do you think we’re still a few years off from the first Naruto or Dragon Ball Z PS4 game. Let us know below! ShonenGameZ $3 Off Play-Asia.com Coupon Now Available! ps4 really need animated game quickly. This is only in one chain store, I saw this the other day and it`s just fun that the Manager and staff had! well i think that if good amount of fans will suport Xenoverse then its going to be like with tenkaichi and budokai series. Its going to be better and better.